HighJump WMS is offered as a traditional, on-premise solution as well as a cloud WMS solution. 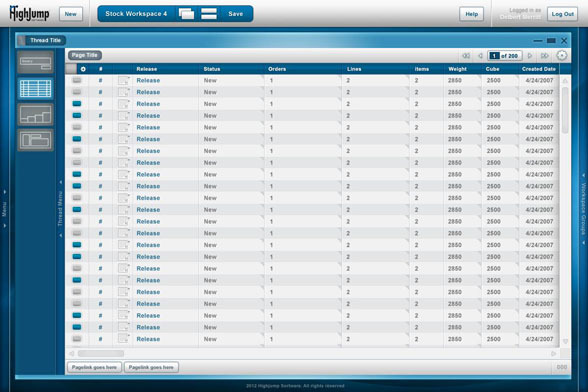 HighJump Cloud WMS can be accessed through a web browser and reduces the IT team’s workload during implementation. Businesses of all sizes in the aerospace and automotive, consumer goods, food and beverage, healthcare, high-tech, logistics services providers/3PLs, manufacturing, retail and wholesale industrial distribution. HighJump WMS helps companies optimize the space that they have, equipment and their employees to help warehouses stay organized and run efficiently. HighJump WMS was designed to manage highly regulated and complex environments by providing WMS solutions built using industry best practices. These best practices are applied to receiving, pick/pack, inventory management, order processing, loading, shipping and other key warehouse functions. HighJump WMS can also be modified to company specific processes using HighJump adaptability tools to make sure companies can get the most out of HighJump WMS. HighJump Software builds their solutions to incorporate industry best practices but also keeps their solutions flexible enough to allows companies to build their own custom workflows. HighJump is a global provider of full suite supply chain management software made to help companies streamline the flow of inventory information from the supplier to the store shelf. To provide a flexible solution, HighJump software offers warehouse management, transportation management, EDI solutions and route accounting solutions as cloud based solutions. HighJump also offers a variety of training options available through HighJump University. HighJump also provides best practice based implementation processes that help their customers complete implementations on time and on budget. HighJump’s solutions are made to meet the needs of 3PL/Logistics service providers, aerospace and automotive, food and beverage, consumer packaged goods, healthcare, high-tech, manufacturing, retail and wholesale/industrial distribution industries. 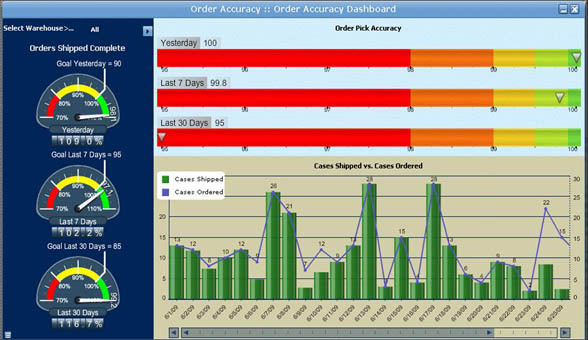 HighJump™ Performance Advantage for the warehouse combines the latest graphical dashboarding technology with industry-developed standards to produce real-time and comparative dashboards using your own data from the HighJump supply chain management software suite and other business systems. This can empower teams with timely, meaningful information to enable significant process improvements. The HighJump™ Yard Advantage yard management system (YMS) provides real-time information, intelligent work direction and complete visibility of trucks, trailers, drivers, goods and materials—from the moment they arrive at the gate to the moment they leave any facility. With a graphical interface, users can manage yard transactions easily. Drag-and-drop functionality converts on-screen trailer moves into RF-directed work for yard drivers. At-a-glance symbols display key information such as trailer type, status, disposition, ownership, which trailers are damaged/out of service, and fuel remaining in refrigerated vehicles. Track the location of trailers and other equipment — no matter where it ends up in the yard — with RFID-based, real-time location tracking. This ensures security and streamlines workflows by providing users with the actual position of equipment in the yard, eliminating time-consuming searches for misplaced trailers. Additionally, dynamic appointment scheduling capabilities will streamline dock assignments, helping to ensure users don’t double book docks—even if circumstances change at the last minute. The HighJump labor management system HighJump™ Labor Advantage, gives users the ability to plan, measure and track labor activities within each organization to increase efficiency. Objectively measure employee performance and identify those whose performance consistently exceeds the standard, as well as employees who need assistance. The HighJump LMS enables users to create individual performance standards, enabling each employee to see what is expected and how he or she is performing against that standard throughout the day. HighJump Labor Advantage is built to run alongside the HighJump warehouse management system and can be integrated with most other warehouse management systems. Integrating labor management with warehouse management system provides users with a comprehensive labor management and planning solution. The HighJump WMS enables users to make rapid adjustments to their system to meet changing market and customer requirements, without disturbing the underlying code or existing personalizations. Now, with the HighJump App Station, users have continuous access to a steady stream of new supply chain innovations—just browse the apps and add the features needed. Containerization helps companies lower their packing and shipping costs, increases productivity, protects shipped products more safely, increases throughput and reduces worker injuries. With the inclusion of HighJump Container Advantage, companies can more efficiently plan cartons, pallets, trailers and ocean containers. HighJump Slotting Advantage is part of the HighJump WMS and helps companies re-slot their warehouses or distribution center to keep up with customer demand. Slotting also helps companies to identify trends and review their past slotting decisions. HighJump WMS can be integrated with Vocollect’s Voice-Directed Distribution to give companies the ability to have real-time communication between the distribution workers and HighJump WMS. Helps companies improve throughput, reduces training time for new employees, improve safety and helps companies leverage voice-enabled picking options. HighJump Advanced Fulfillment Application is integrated with HighJump WMS to help companies improve wave planning and aligns the picking process with the planned waves. This helps companies improve pick efficiency, improve overall throughput, provides greater control over shipping options and streamlines overall workflow. RFID integration with HighJump WMS allows companies to leverage their existing bar code architecture to make the adoption process of RFID technology more seamless. RFID can help companies gain greater visibility into their inventory, improve the overall efficiency of the operation and improve security to guard against product or asset theft. Secrets. They're everywhere, even where you’d least expect to find them. The warehouse management system (WMS) industry is no exception. As you evaluate systems to manage your distribution operations, you'll want to know everything you can to make the search process better. It's not a small project to evaluate, select and implement a WMS. These endeavors take diligence, time and a thorough understanding of your business goals to achieve operational excellence and competitive advantage over the long term. Learning how to critically compare WMS vendors and their various offerings will put you ahead of the game.